Back in 1978, the original Quiznos sandwich shop opened in a converted Sinclair gas station, under the name of Sandwich World. The chain eventually assumed its current name, Quiznos, in 1981. That same year, Quiznos began franchising and spreading across the United States. 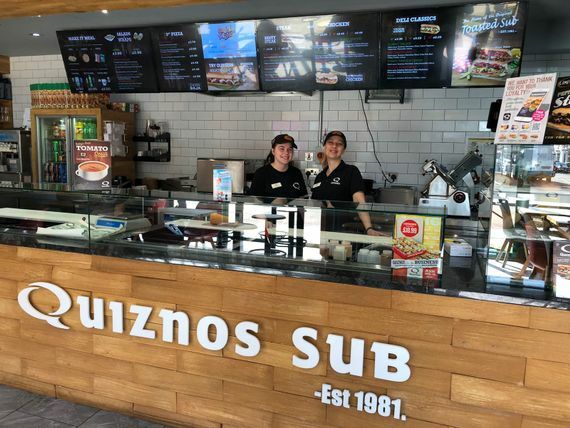 After branching out into Canada during the 1980s and early 1990s, the Canadian division of the company, Quiznos Canada, bought the rights to begin franchising in the UK. This officially began in 2002. The small sub shop that started more than 30 years ago, in Denver, CO, still has the same daring ideas that we had in the beginning. We boldly believe that food should taste fantastic and that only the highest quality ingredients should be used to create your lunch. Think all subs are equal? Rubbish! Toasting is a wake-up call for flavour. We have been sandwich-toasting fanatics since we first opened our doors. Everything gets the toasted treatment at Quiznos. Heck, if it doesn’t come from Quiznos, it’s not going to warm you up. Here at Quiznos, we believe that you cannot fake quality. There’s no mystery meat here – we use high-quality meats, all-natural cheeses, unique signature sauces, and toasted artisan bread. If you want mystery, go to your local library. Our chef is an expert at making delicious subs, but you’re even more of an expert when it comes to your taste. Make your meal your own! Spice it up with our pepper bar, add a little bacon, or switch out the cheese, just don’t jump over the counter and make it yourself; we’ve got hot, hot toasters back here. At Quiznos, our primary goal is to become the franchisor and employer of choice. We work together to achieve our goals, yet embrace our individual differences. What’s more, we know that we cannot achieve our goals without having a diverse assembly of team members, guests, franchises, affiliates, and partners. Respect and acknowledgement of our differences aid us in treating every individual in the manner in which they want to be treated. Quiznos is committed to producing a workplace where our team members are compassionate and show respect for different backgrounds, values, and beliefs. Contact us for further details on the history behind Quiznos.